We have raised in a previous article the issue related to the widespread belief that solar panels are mere commodities. We have defended the case that it would be a simplistic shortcut to come to that conclusion and that the solar panel price was a metric that could not encompass all the features of a photovoltaic module. Like in any other industry, there are differences between products. Some of them are obvious like the power or the color. But what is at stake in our industry is the lifespan of solar panels and in particular their performance over time. After all, when buying solar panels, customers buy the promise of yields. The question is whether or not they will get what they expect or were promised. Nobody likes to wash one’s dirty linen in public. And that’s the case in the industry as well. Reason why you rarely see publicized product failures neither the names behind, like in the case of the “revamping” in Italy. That being said, there has been some articles in the last years, in international newspaper, highlighting publicly issues around solar panels quality like in the New York Times and Bloomberg. The paper of the New York Times features industry insiders testimonies raising their concern over solar panels quality, especially in a context where the price pressure on solar panels and a low margins environment can prompt actors to cut the corners. While there is no need to be alarmist, a number of facts that we can observe reminds us that we do not live in a zero defect industry and that while the costs of solar panels is an important metric, quality and durability are still the most important issues. Field tests data are still limited and it takes years to analyze performance over a long period. According to GTM Research, 85% of the global PV capacity has been installed in the past five years, making it difficult to evaluate what will happen in the next 15 to 25 years. The TUV Rheinland released a study assessing 2000 IEC certification tests performed during 10 years in their facilities and still in 2011 and 2012, 10% of the tests led to failure. How to define the quality of a solar panel? Each individual may have his own definition of the acceptable quality compared to a given solar panel price. 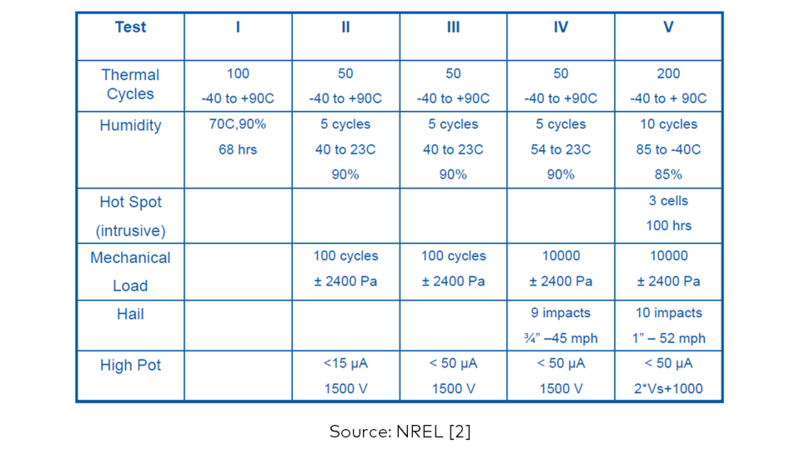 Nevertheless, to make sure a product is of qualitative construction, one often refer to what is a worldwide recognized seal for photovoltaic modules quality, the IEC 61215 certification for crystalline solar panels. The IEC certification is the result of the long commitment of the industry towards quality improvement. To assess quality of solar panels, outdoor performance data must be used. Nevertheless, as it is difficult to wait for long periods, the idea was, from failures observed on the field, to develop accelerated stress tests that could replicate the failures in a much shorter time. It started in the mid 70’s at the NASA’s Jet Propulsion Lab (JPL) which developed “five blocks buys” of accelerated stress tests from 1976 to 1981. They bought different set of modules whose manufacturers had to respect the define set of tests of the corresponding “block”. 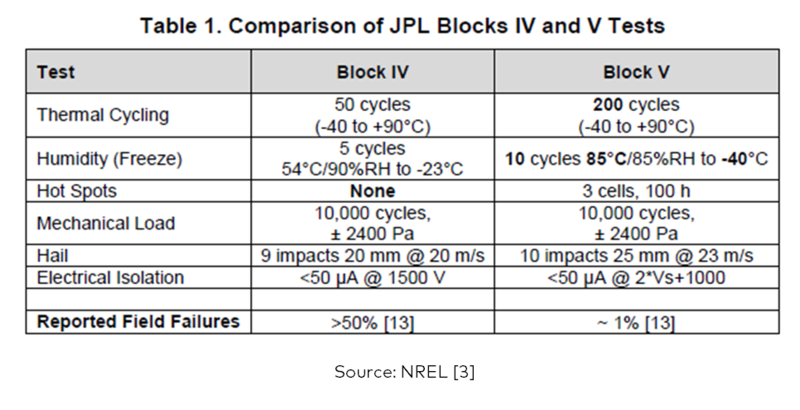 Tests were improved over time with the greatest leap forward between Block IV and Block V.
Based on the groundbreaking work of JPL, the solar community, and in particular the Research Center of the European Commission, continued to develop testing methods which finally led to the enforcement of the IEC 61215 in 1995, a second edition being released in 2005, which became the standard within the industry. Unfortunately, there are often misconceptions about the meaning of IEC certifications and the conclusion one can draw from it to assess the quality of a solar module. The IEC certification was initially designed to reduce infant mortality. John Wohlgemuth, from NREL , defines as follows how should be considered a module that obtained the IEC 61215 certification: “passing the qualification test means the product has met a specific set of requirements. Those modules that have passed the qualification test are much more likely to survive in the field and not have design flaws that lead to infant mortality” as illustrated in the graph hereunder. Then it should be clearly understood that the IEC certification says only little about the behavior of solar panels in the long run, typically in the 20-25 years time frame investors are taking into account, neither about the ability of the product to meet its guarantees. 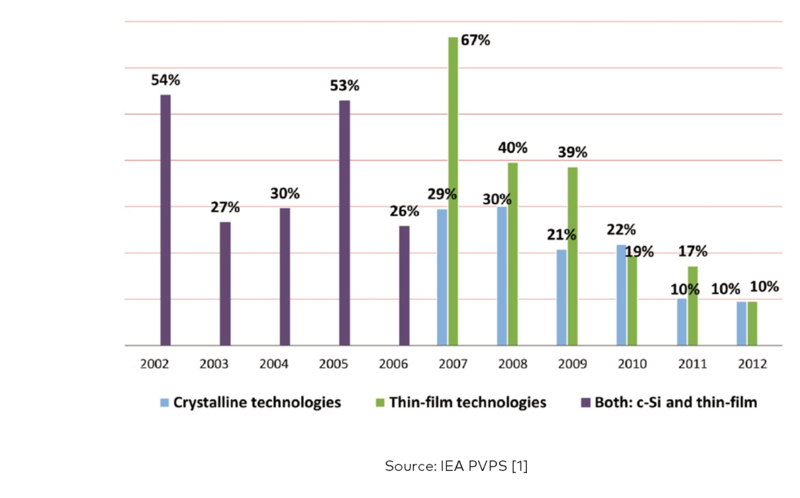 As far as quality is concerned, the evaluation of the long term behavior of solar modules is what is currently at stake in our industry. What do we know on the behavior of solar panels over long periods? The studies around the service lifetime of solar panels are not so numerous. This is understandable as our knowledge grows with the years and the growth of the industry. 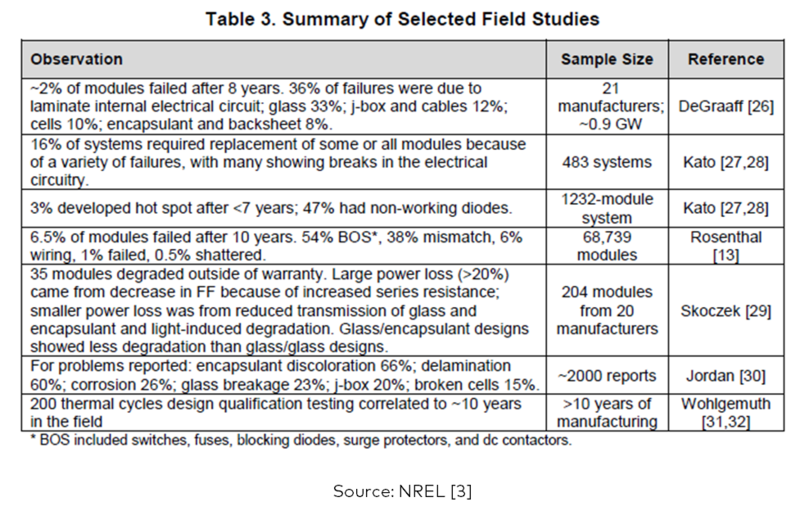 Nevertheless, the studies hereunder have shown that our industry was not immune against failures, and that being granted the IEC 61215 is not a blank cheque for the next 25 years. Between 2011 and 2014, Dupont  realized a global study of 60 installations from 1 kW to 20 MW representing a total output of 200MW. The study showed that 41% of modules presented visual defects, the most important being at the cell/interconnection and backsheet level. 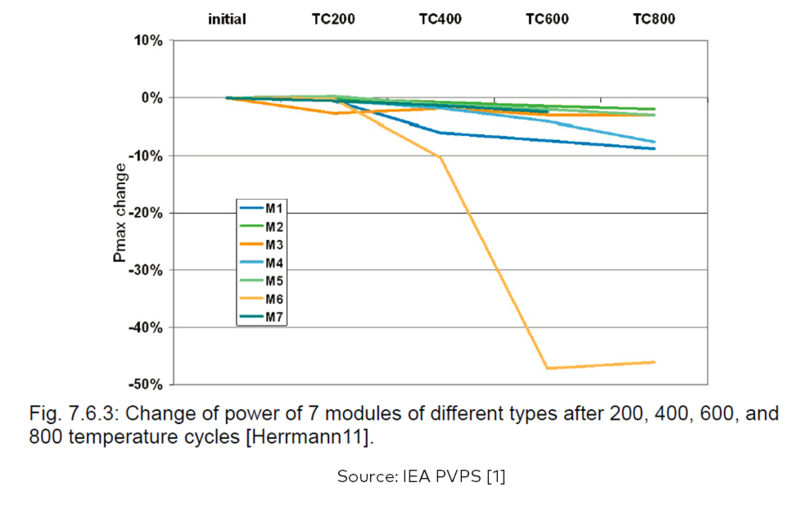 This is not a surprise when we know that this is especially when going beyond IEC tests that differences between modules start to materialize, like illustrated on the two graphs hereunder for Thermal Cycle (IEC is 200 cycles) and Damp Heat (IEC is 1000h). 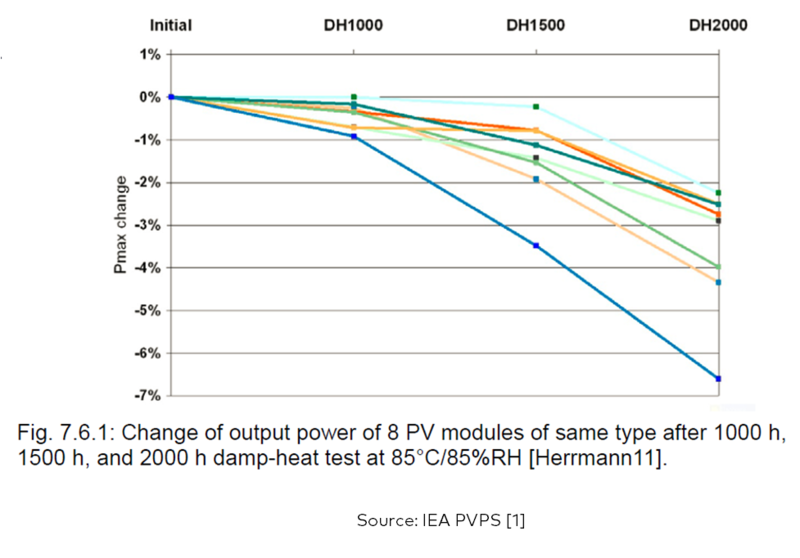 That’s why the current international initiatives around quality aim at formalizing test procedures that go beyond IEC 61215 to ensure the maximum reliability of the PV systems. 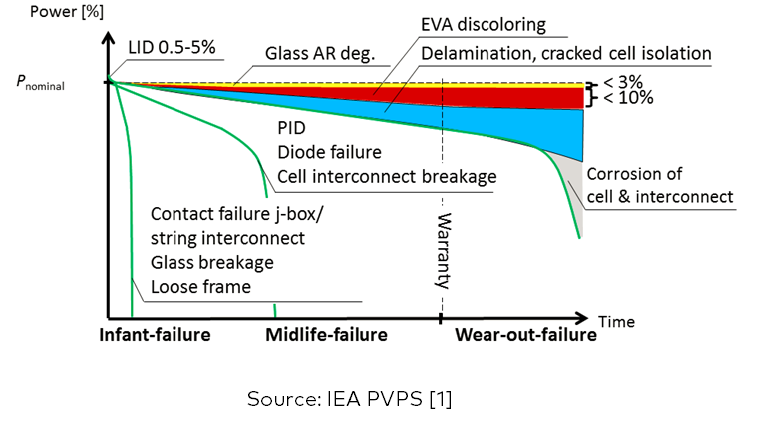 We can name the International PV Quality Task Force, the PVDI from the Fraunhofer or the Qualification Plus Testing from NREL. We can never stress enough the fact that choosing and comparing module suppliers on the basis of datasheets and the cost of solar panels is largely insufficient. Considering the long term consequences of the choice, it is wise to dig deeper to understand who you will be working with. Do the panels have been going under tests going beyond the IEC by independent bodies? Does the Quality Management Management is reliable and trustworthy? … As many questions you may ask yourself before choosing from the next supplier that pops up as the best deal in the last newsletter of your distributor. You want to receive our latest news and blog articles in your mailbox?